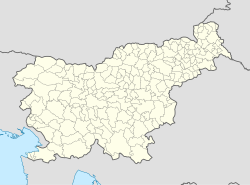 Rakitnik (pronounced [ɾaˈkiːtnik]; Italian: Rachiteni) is a village settlement south of Postojna in the Inner Carniola region of Slovenia. The Postojna Airfield, sometimes also referred to as the Rakitnik Airfield, a grass-covered sports airfield, is located just north of the settlement. The local church is dedicated to the Betrothal of Mary and belongs to the Parish of Matenja Vas. Wikimedia Commons has media related to Rakitnik. This article about the Municipality of Postojna in Slovenia is a stub. You can help Wikipedia by expanding it. This page was last edited on 9 April 2018, at 06:50 (UTC).